I have a light switch (single pole) in my dining room that controls an outlet. I want to separate the switch from the outlet while still providing power to the outlet. The switch I would like to use to control new light fixture being installed in the room. 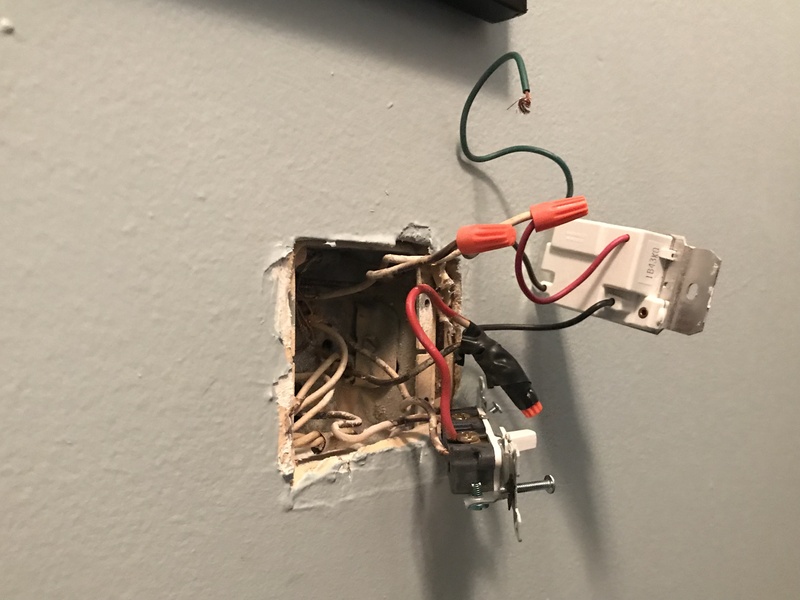 The switch box has 2 switches in it one to the outlet and one to my upstairs hall lights (3-way switch) How can this be done and what is the red wire for? Currently all neutral are wired together and grounds (bare) are the same. There are 4 circuits going into the box from what I can see. Leave the 3-way switch alone! Colors don't mean half as much as you'd like. Actually, they are there to distinguish wires in cable. Only ground has a reserved "color", though if present, neutral must be on white. The red wire is nothing but a pigtail, it could be purple for all it matters. People tend to make pigtails with any old bit of scrap they have lying around. the black wire going from that wire nut to the smart switch. I would rend the wire out of that backstab and put it under the wire nut, as this will make the wiring easier to understand. And also because the backstab and screw method is bad, and also because backstabs are lousy in the first place. So now, the clump of blacks (and red pigtail) are almost certainly the supply hot coming into this box. Now it becomes clear: the solitary black wire on the switch is the switched-hot wire going to the receptacle. You can take it from here, I trust. This is not a direct answer to your question, but more of a helpful opinion. I will never push wires into the back of a plug or a switch. This connection is all dependent on a tiny knife-edge cutting into the side of the copper conductor. Now add a load. This will create heat, and the smaller the connection the greater the electrical resistance there will be. Result; more heat, maybe even melting of the switch. Not good. IMHO these "back stabs" should be banned. Use the wire binding terminal screws instead of back stabbing. Combine two independent switches into 3-way? How can I subfeed a single pole switch from a 3-way switch to control a fluorescent light?